1 A None No Power Seat 1 A is a standard Business Class seat at a bulkhead seat that transforms into a fully flat bed. The close proximity to the galley and lavatory area might be bothersome. 1 B None No Power Seat 1 B is a standard Business Class seat at a bulkhead seat that transforms into a fully flat bed. The close proximity to the galley and lavatory area might be bothersome. 1 E None No Power Seat 1 E is a standard Business Class seat located at a bulkhead that transforms into a fully flat bed. 1 F None No Power Seat 1 F is a standard Business Class seat located at a bulkhead that transforms into a fully flat bed. 10 C None No Power Seat 10 C is an Economy Plus seat. All C seats may have an entertainment equipment box under the seat, limiting the legroom and the storage space underneath the seat in front. 10 D None No Power Seat 10 D is a standard Economy Plus seat. All D seats may have an entertainment equipment box under the seat, limiting the legroom and the storage space underneath the seat in front. 11 A None No Power Seat 11 A is a standard Economy Plus seat, however this row has a misaligned window. 11 C None No Power Seat 11 C is an Economy Plus seat. All C seats may have an entertainment equipment box under the seat, limiting the legroom and the storage space underneath the seat in front. 11 D None No Power Seat 11 D is a standard Economy Plus seat. All D seats may have an entertainment equipment box under the seat, limiting the legroom and the storage space underneath the seat in front. 11 F None No Power Seat 11 F is a standard Economy Plus seat, however this row has a misaligned window. 12 C None No Power Seat 12 C has limited recline due to the Exit Row behind. All C seats may have an entertainment equipment box under the seat, limiting the legroom and the storage space underneath the seat in front. 12 D None No Power Seat 12 D has limited recline due to the Exit Row behind. All C seats may have an entertainment equipment box under the seat, limiting the legroom and the storage space underneath the seat in front. 20 A None No Power Seat 20 A is an Economy Plus seat with extra legroom due to the Exit Row in front, but also has no recline due to the Exit Row in back. 20 B None No Power Seat 20 B is an Economy Plus seat with extra legroom due to the Exit Row in front, but also has no recline due to the Exit Row in back. 20 C None No Power Seat 20 C is an Economy Plus seat with extra legroom due to the Exit Row in front, but also has no recline due to the Exit Row in back. 20 D None No Power Seat 20 D is an Economy Plus seat with extra legroom due to the Exit Row in front, but also has no recline due to the Exit Row in back. 20 E None No Power Seat 20 E is an Economy Plus seat with extra legroom due to the Exit Row in front, but also has no recline due to the Exit Row in back. 20 F None No Power Seat 20 F is an Economy Plus seat with extra legroom due to the Exit Row in front, but also has no recline due to the Exit Row in back. 21 A None No Power Seat 21 A is an Economy Plus seat that has extra legroom due to the Exit Row in front. However, the window side armrest is attached to the Exit door and some passengers find it chilly in this Exit seat. This seat does not have overhead storage. 21 B None No Power Seat 21 B is an Economy Plus seat that has extra legroom due to the Exit Row in front. This seat does not have overhead storage. 21 C None No Power Seat 21 C is an Economy Plus seat that has extra legroom due to the Exit Row in front. 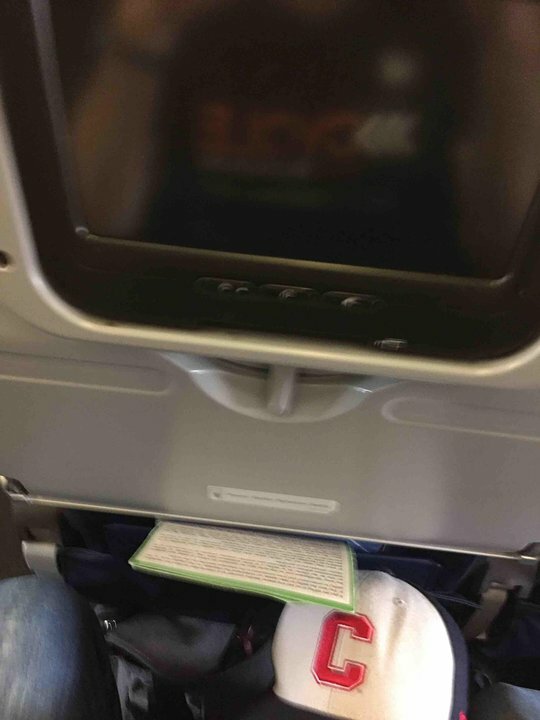 Some of this legroom may be restricted due to the presence of an entertainment equipment box. This seat does not have overhead storage. 21 D None No Power Seat 21 D is an Economy Plus seat that has extra legroom due to the Exit Row in front. This seat does not have overhead storage. 21 E None No Power Seat 21 E is an Economy Plus seat that has extra legroom due to the Exit Row in front. This seat does not have overhead storage. 21 F None No Power Seat 21 F is an Economy Plus seat that has extra legroom due to the Exit Row in front. This seat does not have overhead storage. 22 A None No Power Seat [SEATS} is a standard Economy Class seat. 22 B None No Power Seat [SEATS} is a standard Economy Class seat. 22 C None No Power Seat 22 C is a standard Economy Class seat. All C seats may have an entertainment equipment box under the seat, limiting the legroom and the storage space underneath the seat in front. 22 D None No Power Seat 22 D is a standard Economy Class seat. All D seats may have an entertainment equipment box under the seat, limiting the legroom and the storage space underneath the seat in front. 22 E None No Power Seat [SEATS} is a standard Economy Class seat. 22 F None No Power Seat [SEATS} is a standard Economy Class seat. 23 A None No Power Seat [SEATS} is a standard Economy Class seat. 23 B None No Power Seat [SEATS} is a standard Economy Class seat. 23 C None No Power Seat 23 C is a standard Economy Class seat. All C seats may have an entertainment equipment box under the seat, limiting the legroom and the storage space underneath the seat in front. 23 D None No Power Seat 23 D is a standard Economy Class seat. All D seats may have an entertainment equipment box under the seat, limiting the legroom and the storage space underneath the seat in front. 23 E None No Power Seat [SEATS} is a standard Economy Class seat. 23 F None No Power Seat [SEATS} is a standard Economy Class seat. 24 A None No Power Seat [SEATS} is a standard Economy Class seat. 24 B None No Power Seat [SEATS} is a standard Economy Class seat. 24 C None No Power Seat 24 C is a standard Economy Class seat. All C seats may have an entertainment equipment box under the seat, limiting the legroom and the storage space underneath the seat in front. 24 D None No Power Seat 24 D is a standard Economy Class seat. All D seats may have an entertainment equipment box under the seat, limiting the legroom and the storage space underneath the seat in front. 24 E None No Power Seat [SEATS} is a standard Economy Class seat. 24 F None No Power Seat [SEATS} is a standard Economy Class seat. 25 A None No Power Seat [SEATS} is a standard Economy Class seat. 25 B None No Power Seat [SEATS} is a standard Economy Class seat. 25 C None No Power Seat 25 C is a standard Economy Class seat. All C seats may have an entertainment equipment box under the seat, limiting the legroom and the storage space underneath the seat in front. 25 D None No Power Seat 25 D is a standard Economy Class seat. All D seats may have an entertainment equipment box under the seat, limiting the legroom and the storage space underneath the seat in front. 25 E None No Power Seat [SEATS} is a standard Economy Class seat. 25 F None No Power Seat [SEATS} is a standard Economy Class seat. 26 A None No Power Seat [SEATS} is a standard Economy Class seat. 26 B None No Power Seat [SEATS} is a standard Economy Class seat. 26 C None No Power Seat 26 C is a standard Economy Class seat. All C seats may have an entertainment equipment box under the seat, limiting the legroom and the storage space underneath the seat in front. 26 D None No Power Seat 26 D is a standard Economy Class seat. All D seats may have an entertainment equipment box under the seat, limiting the legroom and the storage space underneath the seat in front. 26 E None No Power Seat [SEATS} is a standard Economy Class seat. 26 F None No Power Seat [SEATS} is a standard Economy Class seat. 27 A None No Power Seat [SEATS} is a standard Economy Class seat. 27 B None No Power Seat [SEATS} is a standard Economy Class seat. 27 C None No Power Seat 27 C is a standard Economy Class seat. All C seats may have an entertainment equipment box under the seat, limiting the legroom and the storage space underneath the seat in front. 27 D None No Power Seat 27 D is a standard Economy Class seat. All D seats may have an entertainment equipment box under the seat, limiting the legroom and the storage space underneath the seat in front. 27 E None No Power Seat [SEATS} is a standard Economy Class seat. 27 F None No Power Seat [SEATS} is a standard Economy Class seat. 28 A None No Power Seat [SEATS} is a standard Economy Class seat. 28 B None No Power Seat [SEATS} is a standard Economy Class seat. 28 C None No Power Seat 28 C is a standard Economy Class seat. All C seats may have an entertainment equipment box under the seat, limiting the legroom and the storage space underneath the seat in front. 28 D None No Power Seat 28 D is a standard Economy Class seat. All D seats may have an entertainment equipment box under the seat, limiting the legroom and the storage space underneath the seat in front. 28 E None No Power Seat [SEATS} is a standard Economy Class seat. 28 F None No Power Seat [SEATS} is a standard Economy Class seat. 29 A None No Power Seat [SEATS} is a standard Economy Class seat. 29 B None No Power Seat [SEATS} is a standard Economy Class seat. 29 C None No Power Seat 29 C is a standard Economy Class seat. All C seats may have an entertainment equipment box under the seat, limiting the legroom and the storage space underneath the seat in front. 29 D None No Power Seat 29 D is a standard Economy Class seat. All D seats may have an entertainment equipment box under the seat, limiting the legroom and the storage space underneath the seat in front. 29 E None No Power Seat [SEATS} is a standard Economy Class seat. 29 F None No Power Seat [SEATS} is a standard Economy Class seat. 30 A None No Power Seat [SEATS} is a standard Economy Class seat. 30 B None No Power Seat [SEATS} is a standard Economy Class seat. 30 C None No Power Seat 30 C is a standard Economy Class seat. All C seats may have an entertainment equipment box under the seat, limiting the legroom and the storage space underneath the seat in front. 30 D None No Power Seat 30 D is a standard Economy Class seat. All D seats may have an entertainment equipment box under the seat, limiting the legroom and the storage space underneath the seat in front. 30 E None No Power Seat [SEATS} is a standard Economy Class seat. 30 F None No Power Seat [SEATS} is a standard Economy Class seat. 31 A None No Power Seat [SEATS} is a standard Economy Class seat. 31 B None No Power Seat [SEATS} is a standard Economy Class seat. 31 C None No Power Seat 31 C is a standard Economy Class seat. All C seats may have an entertainment equipment box under the seat, limiting the legroom and the storage space underneath the seat in front. 31 D None No Power Seat 31 D is a standard Economy Class seat. All D seats may have an entertainment equipment box under the seat, limiting the legroom and the storage space underneath the seat in front. 31 E None No Power Seat [SEATS} is a standard Economy Class seat. 31 F None No Power Seat [SEATS} is a standard Economy Class seat. 32 A None No Power Seat [SEATS} is a standard Economy Class seat. 32 B None No Power Seat [SEATS} is a standard Economy Class seat. 32 C None No Power Seat 32 C is a standard Economy Class seat. All C seats may have an entertainment equipment box under the seat, limiting the legroom and the storage space underneath the seat in front. 32 D None No Power Seat 32 D is a standard Economy Class seat. All D seats may have an entertainment equipment box under the seat, limiting the legroom and the storage space underneath the seat in front. 32 E None No Power Seat [SEATS} is a standard Economy Class seat. 32 F None No Power Seat [SEATS} is a standard Economy Class seat. 34 A None No Power Seat [SEATS} is a standard Economy Class seat. 34 B None No Power Seat [SEATS} is a standard Economy Class seat. 34 C None No Power Seat 34 C is a standard Economy Class seat. All C seats may have an entertainment equipment box under the seat, limiting the legroom and the storage space underneath the seat in front. 34 D None No Power Seat 34 D is a standard Economy Class seat. All D seats may have an entertainment equipment box under the seat, limiting the legroom and the storage space underneath the seat in front. 34 E None No Power Seat [SEATS} is a standard Economy Class seat. 34 F None No Power Seat [SEATS} is a standard Economy Class seat. 35 A None No Power Seat [SEATS} is a standard Economy Class seat. 35 B None No Power Seat [SEATS} is a standard Economy Class seat. 35 C None No Power Seat 35 C is a standard Economy Class seat. All C seats may have an entertainment equipment box under the seat, limiting the legroom and the storage space underneath the seat in front. 35 D None No Power Seat 35 D is a standard Economy Class seat. All D seats may have an entertainment equipment box under the seat, limiting the legroom and the storage space underneath the seat in front. 35 E None No Power Seat [SEATS} is a standard Economy Class seat. 35 F None No Power Seat [SEATS} is a standard Economy Class seat. 36 A None No Power Seat [SEATS} is a standard Economy Class seat. 36 B None No Power Seat [SEATS} is a standard Economy Class seat. 36 C None No Power Seat 36 C is a standard Economy Class seat. All C seats may have an entertainment equipment box under the seat, limiting the legroom and the storage space underneath the seat in front. 36 D None No Power Seat 36 D is a standard Economy Class seat. All D seats may have an entertainment equipment box under the seat, limiting the legroom and the storage space underneath the seat in front. 36 E None No Power Seat [SEATS} is a standard Economy Class seat. 36 F None No Power Seat [SEATS} is a standard Economy Class seat. 37 A None No Power Seat [SEATS} is a standard Economy Class seat. 37 B None No Power Seat [SEATS} is a standard Economy Class seat. 37 C None No Power Seat 37 C is a standard Economy Class seat. All C seats may have an entertainment equipment box under the seat, limiting the legroom and the storage space underneath the seat in front. 37 D None No Power Seat 37 D is a standard Economy Class seat. All D seats may have an entertainment equipment box under the seat, limiting the legroom and the storage space underneath the seat in front. 37 E None No Power Seat [SEATS} is a standard Economy Class seat. 37 F None No Power Seat [SEATS} is a standard Economy Class seat. 38 A None No Power Seat [SEATS} is a standard Economy Class seat. 38 B None No Power Seat [SEATS} is a standard Economy Class seat. 38 C None No Power Seat 38 C is a standard Economy Class seat, however the close proximity to the lavatories may be bothersome. All C seats may have an entertainment equipment box under the seat, limiting the legroom and the storage space underneath the seat in front. 38 D None No Power Seat 38 D is a standard Economy Class seat, however the close proximity to the lavatories may be bothersome. All D seats may have an entertainment equipment box under the seat, limiting the legroom and the storage space underneath the seat in front. 38 E None No Power Seat [SEATS} is a standard Economy Class seat. 38 F None No Power Seat [SEATS} is a standard Economy Class seat. 39 A None No Power Seat [SEATS} is a standard Economy Class seat. 39 B None No Power Seat [SEATS} is a standard Economy Class seat. 39 C None No Power Seat 39 C is a standard Economy Class seat, however the close proximity to the lavatories may be bothersome. All C seats may have an entertainment equipment box under the seat, limiting the legroom and the storage space underneath the seat in front. 39 D None No Power Seat 39 D is a standard Economy Class seat, however the close proximity to the lavatories may be bothersome. All D seats may have an entertainment equipment box under the seat, limiting the legroom and the storage space underneath the seat in front. 39 E None No Power Seat [SEATS} is a standard Economy Class seat. 39 F None No Power Seat [SEATS} is a standard Economy Class seat. 40 A None No Power Seat 40 A is in the last row of the plane and may have limited or no recline. The close proximity to the lavatories and galley may be bothersome. 40 B None No Power Seat 40 B is in the last row of the plane and may have limited or no recline. The close proximity to the lavatories and galley may be bothersome. 40 C None No Power Seat 40 C is in the last row of the plane and may have limited or no recline. The close proximity to the lavatories and galley may be bothersome. All C seats may have an entertainment equipment box under the seat, limiting the legroom and the storage space underneath the seat in front. 40 D None No Power Seat 40 D is in the last row of the plane and may have limited or no recline. The close proximity to the lavatories and galley may be bothersome. All D seats may have an entertainment equipment box under the seat, limiting the legroom and the storage space underneath the seat in front. 40 E None No Power Seat 40 E is in the last row of the plane and may have limited or no recline. The close proximity to the lavatories and galley may be bothersome. 40 F None No Power Seat 40 F is in the last row of the plane and may have limited or no recline. The close proximity to the lavatories and galley may be bothersome. 7 A None No Power Seat 7 A is an Economy Plus seat, however the proximity to the lavatory may be bothersome. There is no floor storage for this seat during take-off and landing. 7 B None No Power Seat 7 B is an Economy Plus seat, however the proximity to the lavatory may be bothersome. There is no floor storage for this seat during take-off and landing. 7 C None No Power Seat 7 C is an Economy Plus seat, however the proximity to the lavatory may be bothersome. There is no floor storage for this seat during take-off and landing. 8 C None No Power Seat 8 C is an Economy Plus seat. All C seats may have an entertainment equipment box under the seat, limiting the legroom and the storage space underneath the seat in front. 8 D None No Power Seat 8 D is an Economy Plus Bulkhead seat with extra legroom. There is a cutout in the Bulkhead for additional foot room. There is no floor storage for this seat during take-off and landing. 8 E None No Power Seat 8 E is an Economy Plus Bulkhead seat with extra legroom. There is a cutout in the Bulkhead for additional foot room. There is no floor storage for this seat during take-off and landing. 8 F None No Power Seat 8 F is an Economy Plus Bulkhead seat with extra legroom. There is a cutout in the Bulkhead for additional foot room. There is no floor storage for this seat during take-off and landing. 9 C None No Power Seat 9 C is an Economy Plus seat. All C seats may have an entertainment equipment box under the seat, limiting the legroom and the storage space underneath the seat in front. 9 D None No Power Seat 9 D is a standard Economy Plus seat. All D seats may have an entertainment equipment box under the seat, limiting the legroom and the storage space underneath the seat in front. The seat map reflects the United Airlines 757-200 used on long-haul intercontinental routes. This configuration features Polaris flat bed seats, Economy Plus, and Economy seats. 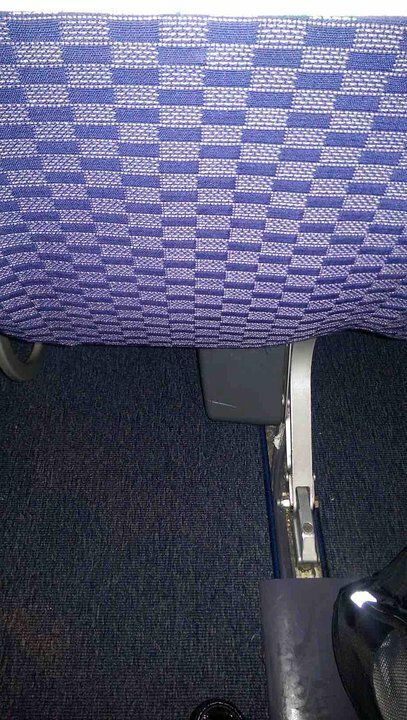 In Economy Plus and Economy Class, seats in rows C and D may have an entertainment equipment box under the seat, limiting the legroom and the storage space underneath the seat in front. Best seat in economy as far as I'm concerned. There is Economy Plus legroom plus a cutout thrown in, plenty of space. No seat in front to recline into your face. The seat may be narrower than others but I didn't notice . Almost no at seat storage. The leg of the seat in front is inconveniently placed to start with, then there's a big grey box strapped to it. You might squeeze a small cat in there, but nothing larger. While there is extra legroom, there is no floor storage during take off and landing. 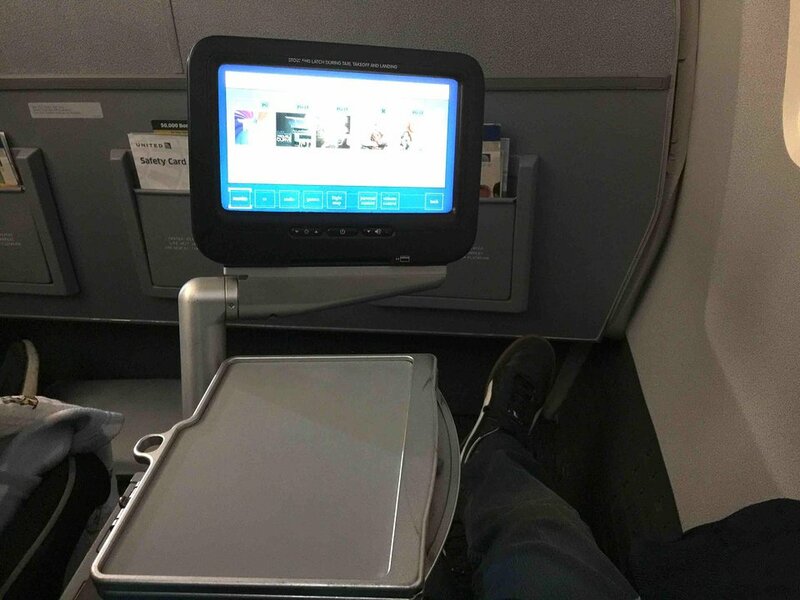 Also, the tray table and the TV screen are on the side, which means the TV screen has to be stowed during taxi, landing and take off, which is unpleasant when one wants to use the screen during taxi, landing and take off. Seat 1AB is a bassinet location. I was pleasantly surprised upon boarding in November to find a lay flat "pod" instead of just a standard seat. It was very comfy, with a great screen and plenty or arm and shoulder room. The leg room was a bit cramped even in lie flat configuration (I'm 6' 1"), so taller folks may want a different seat or airplane. Also, the leg area angles inwards, taking away some side to side leg room. The one big issue is that if you're in the window seat as I was (4A) and the person to your right or left falls asleep in the lay flat configuration, good luck getting out to use the lavatory. You're stuck unless you want to wake him or her up. 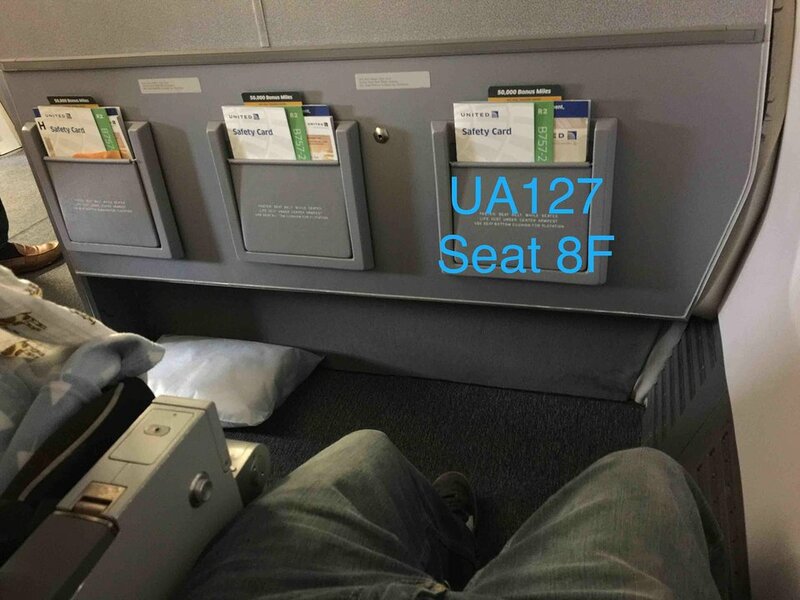 This will happen with just about any narrowbody first class product so I'm not overtly criticizing United; its just something to be aware of as a passenger. Also, this is really more of a business-class seat and product masquerading as first class on a narrowbody. Again, not meant as a horrid criticism, but it is something to be aware of if you're accustomed to "real" first class. Since I fly first class about once a every other decade if I'm lucky it didn't matter to me and I loved the flight and the overall product, but again its just something to be aware of. The bottom line, I really enjoyed my flight on UAL417 from LAX to OGG. It was a great flight, the seat was very comfortable, the amenities were fine, and the cabin crew was wonderful. Flew this plane from Denver to Kona. I am only 5'1" and the leg room was cramped - more than other plane types I've flown. The seat was not very comfortable - not much cushioning. My husband in front of me - seat 23A - said he could feel everytime I "poked" the TV screen. I would not fly this plane again. Also, they ran out of decent food - sandwiches/pizza/salad - right before they got to my row and this was a 7 hour flight !!! The seat was terribly uncomfortable. It's an Exit-Row-style seating configuration with tray-tables in the arm rests. This means the actual width if the seat is narrower than usual. There is also no screen in front of the row for in-flight viewing. Leg room was ample, but I'm a decently large guy, and could barely fit in the seat. This was also the first time I've ever had to use a belt-extender, even though most seats usually have plenty of belt length for me. Basic aircraft, does the job. Looking a bit dated now compared to the more modern planes. The seat in front of this one had an electric box underneath, so leg room cramped. The seat had minimal cushioning; the space between back and seat had a gap so whenever person seated behind accessed their pocket I was directly poked in my lumbar region. Weird. Little tv doesn't work well, person behind pushing buttons relentlessly to get video to load caused my head to bounce with every irritated tap tap tap tap tap..the plane was smelly. Recently flew this aircraft from Newark to Edinburgh, seated in 1A. The 757 is a narrow and cramped aircraft that is not very suitable or comfortable for a 6 1/2 hour transatlantic flight, even in business class. I would try to avoid it in the future for such trips. The galley was brightly lit overnight, with FAs congregating and having loud conversations, from seats 1A and B these noises and sounds are unavoidable and make it almost impossible to sleep. Also avoid aisle seats in Row 4 as they as located very close to a lavatory directly behind. Tons of leg room in this bulkhead seat. Entertainment screen mounted on side and lifts up, similar to the in-armrest tables. The bathroom is further forward, so you don't get the sound of toilet flushing and door opening & closing like you do on a 737 or Airbus 320. Awesome red eye flight experience. I thought that it would be cramped and weird inside a narrowbody for a 7.5 hour flight. But it was the opposite. It was an amazing flight, and Polaris was really nice and comfortable. The seat was really comfortable, and reclined into a fully flat bed. It had an outlet to the right of the seat, so I charged my laptop. Really enjoyed the 757 and the Polaris. I slept during the whole flight, I would take it again. There legroom issue noted was not too bad however the entertainment system on this plane was not working for the majority of passengers. They activated the onboard wifi for all passengers however I could get was movie previews and not the actual movies. Disappointing considering the two hour delay plus flight time from SFO to EWR. Great legroom but United has replaced the bulkhead seats with narrower seats to get more people on the plane. I'm average in size (5'9" & 150 pounds) and almost don't fit. Awful seats. Lots of legroom and with nobody in the middle seat, LHR-EWR was great. But, the plane is old and tired and probably should be flying in the USA. I am surprised that United consider this aircraft is suitable (as in comfortable) for international sectors given the lack of space in the Economy cabins. Flew IAD to LHR and was saved by the fact that it was a light flight in terms of passengers but it reminded me of when I flew United from Newark to Glasgow which was one of the most uncomfortable flight I have ever had. Come on United get a bigger aircraft for flight over 5 hours. A horrid seat on a horrid plane. There is no room under the seat in front for any luggage, and the whole plane is so cramped that you'll likely be separated from both your bags stowed in the overhead. I took out the stacks of advertisements from the seat pocket and was able to store my laptop (precariously) and jam a headseat in, and then put the baggie with my toothbrush on the floor. No room for a Kindle or a granola bar. The volume is 'off' on the announcements--if you're watching a movie using headphones, if they interrupt you to make an announcement (which they will, for every meal and beverage service, every time the seatbelt sign goes on and off, cruising altitude, etc. ), you'll get *blasted*. By the time the flight landed, my ears were actually ringing. The flight was full of people frantically yanking their headphone jacks out and rubbing their ears with every announcement. This aircraft on the Manchester to Newark run is a very old aircraft. British seat mates reported they had booked with Lufthansa and they indicated this was a newer aircraft. Seat is typical United tight one and the electrics box really limits what can go under the seat.....a medium handbag is basically it. For the price they should upgrade the plane. Row 7 has fixed armrests so dont expect to lay down on this row. Adjacent to main cabin door; often colder than the rest of the cabin. People looking for space to stretch or exercise their children often use the area in front of the seats. United has been flying this configuration of 757 on many if not most of their flights between Los Angeles and Newark lately, as opposed to the configuration marked as "PS". The best rows in Economy Plus on this plane, by far, are rows 7 A-C and 8 D-F. Row 7 has unlimited leg room, as it is situated right at one of the doors, with nothing in front of it. The space in front of 7A is slightly restricted by the bulge in the door, but this is not all that bothersome. Be aware, though, that these seats have no entertainment monitors at all, so best to bring your own device with you, or just a plain old book. For overnight flights, Row 8 would be better, as light from the galley would probably be bothersome for sleeping if you are in 7. Be warned: in Economy Plus on this aircraft seats #7D/7E are regularly occupied by parents with infant children. Given discomfort that a child can feel on a long trip, there can be lots of crying and screaming all across the Atlantic. There is no way to avoid it in the surrounding seats, especially in #7F. Bulkhead seat had immobile armrests. There's a personal TV screen, though headphones must be unplugged during takeoff and landing given the exit row position. There wasn't as much legroom despite being the bulkhead seat; in addition, since this was in front of another exit row, the seat could not lean back. This seat was awesome. The legroom is nearly infinite thanks to the bulkhead cutout, and even from my window seat, I could access the aisle without having to wake up people next to me. Also the galley lights did not bother me at all, whereas they always were shining on the poor people on Row 7 and even 8A. The downsides were (1) the AVOD screen not locking into place when deployed and (2) having no floor storage, but 8DEF are still the best seats in the entire economy cabin. misaligned window but its not bad. the window is Perfectly fine. Dont be afraid to choose this seat. Flew in this seat for an 8hr DUB-IAD flight. Lots of space for economy (even tho you pay a premium to sit here) -although on a full flight in this cramped, outdated, single aisled aircraft, you will be grateful for every inch of space you can get. A downfall is if you are sitting next to strangers, you have to ask both of them to exit the row in order for you to get out to go to the loo etc. The row does have a window on both sides however the window is slightly off centre, however it is still easy to use and look through the window fully. Electronic box under seat limiting leg room. Very limited underseat storage due to electronics box under seat 7c. EWR-CDG. Seat was comfortable, good cushioning and winged headrest that could be raised. IFE was older, but had all of the latest selections, although I could not find Channel 9. A dinner was provided during the flight, and it was done quickly due to the 9:30 PM departure. Before landing, a croissant with yogurt was served. The seat reclined a good amount, and I was able to sleep in it. I am 5'6, and had plenty of legroom. A good first time flying United. 21D Premium Economy Exit Row seat with plenty of legroom. I'm 6' 2" and there must be 6 inches of legroom beyond my knees and Row 20 seats do not recline into you. Not designed for a normal person. I was next to a large lady and could not breathe. I'm 6 ft tall and 240 Our shoulders were in contact throughout. This was the worst plane I have flown on. The seat where tight nd no leg room for m e and my wife.went to the toliet and had to wait 15 minutes to get back to sea t because food was be served and with only one aisle. Not a bad flight, great service, IFE could be better but not terrible! I much enjoyed my flight with United Airlines, as usual. I've been to the US once before and travelled United Airlines at least 5 times from their Newark hub. The Economy Plus seats are worth the extra hundred pounds as the legroom is brilliant, the IFE could be better, but I always bring a tablet on board with films already pre-loaded on. Couldn't complain! Reconsider choosing this flight if you are flying Trans-Atlantic!! I travel fairly regularly around the US and planes with spacing and seats like this are commonplace. If your flight is 1-3 hours it is bearable. For the Trans-Atlantic flights they add an LCD screen. Movies/shows were free and that was the one major plus to this flight. However this means that they add an extra "box" underneath the seat that further restricts what little leg room you have. I have a 34" inseam and 8 hours on this plane felt a little like torture. Food was good, service was good, movies/shows for free was great, but the seats were really old, small, and uncomfortable. 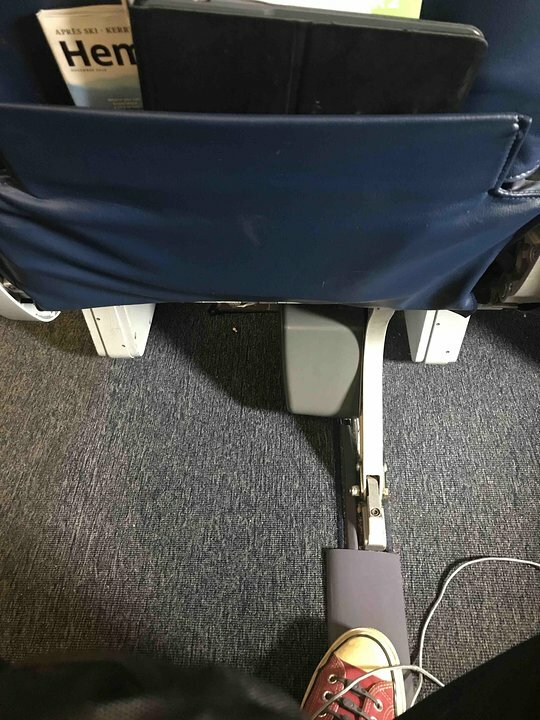 It is difficult to store items under the seat in front of you, and if you have longish legs (I have a 34 inch inseam), it's difficult to fit your feet under the seat. This is because this row is the row behind the bulkhead row. For the bulkhead row, there is extra equipment below the seat. The extra equipment is for the pop-up LCD screen that the bulkhead customers have, because there is no seat in front of the bulkhead row to present the LCD screen. The equipment for the pop-up LCD screen takes approximately 4 inches of width. This is in addition to the approximately 5 inches of width that is taken under every row of seats to handle the entertainment system. This seat has limited under seat storage. You will not be able to fit a backpack completely under the seat, but you may be able to fit a small purse. This seat was just back of the wing, and was great with 2 windows. This is a good seat for the window, it's just behind the wing. 28F would also be good. additional thing to notice is for late night flight, this row is next to the work station (on the right). So there is light from the work station. The rows are DEF side are better for sleep. 21A is probably the best seat on this jet. I flew DUB-EWR on N14120. Most legroom I ever had on a flight. Seat in front cannot recline but you can. People here have said this seat can be cold as its beside the door but I disagree, it was fine. Row 21 in general is the best in Economy, try and get it, you wont regret it! Seat does offer a slight recline. Not full, but better than nothing. Sign on wall says something to the effect that recline is limited due to FAA regulations. The bulkhead business class is a bit tight for the long legged. 1E is worse than 1F, because the seats are angled outwards, so you get an exrtra couple inches with 1F. Don't get on this plane, use the TAP flight!! This plane should never be used for transatlantic flights, too small. It's like flying on EasyJet (Southwest in the US). One very narrow aisle, not enough space for carry-ons, seats are outdated and very used. The box under the seat in front doesn't let you stretch both legs jus one, very unconfortable. Decent legroom, but it was freezing cold! Some have complained that this equipment is outdated and the economy section is cramped, but I got stuck in row 35 on this plane for a 5 hour flight, and I must say it was a far cry better than the other 757-200 configuration that United flies cross-country. This is a former Continental plane, and doesn't have United newer slim-profile seats, or as bulky of an entertainment system under the seats. The result is more legroom and a much more usable old-fashioned seat pocket (the newer ones won't even fit a water bottle). I usually get Economy Plus when available, but for this equipment, regular Economy was bearable. Seat 4A is reserved for pilots on transatlantic flights (seriously). So if you're sitting in 4B, the pilot will be stepping over you. They don't let you switch for the window since the 4A seat is "in their contract" Lovely for a $5K+ ticket. Very little leg room. The entertainment box under the seat in front takes almost half of the space for your feet. A transatlantic flight on this plane is very uncomfortable. The whole plane feels very cramped and old. Comfortable pitch in a small cabin. Wifi surprisingly good for email, websites etc and power takes a UK socket. Seat back entertainment awful. 3 hours of glitches and when they rebooted it the system failed altogether. Limited room to stow items under seat due to entertainment console. As stated in the description, seat 8C, while in Economy Plus, has dreadfully poor legroom. This was very uncomfortable on the long Honolulu to Denver overnight flight. There is no overhead space for the last few rows of this plane. Also this plane seems rather old and tired. It is one of the worst international flights I have been on. I only took this flight since it was one of the only non-stops from IAD to DUB. Seat 10F was fine. Plenty of leg room. A bit of a misaligned window. 21F is an E+ seat. second exit row so it reclines fully and the seat in front doesn't recline at all so it seems like you have a world of space at your seat. I was on the 10p from EWR-EDI. Got on the plane, stretched out, and went to sleep for almost the entire flight. Good seat. I have 21A on the other side of the plane for my return. Seat 34C has what I believe is an electronics box, either way wires from the floor are wired to that box. It limits leg space on the left side of the floor underneath the seat before you. Seat 4E sits exactly across the aisle from the economy restroom, and it smells horrible. This is a bad seat. Great seat on this plane, probably the best to hope for with economy plus. Lots of leg room to stretch out, and unlike the row in front (20), row 21 does indeed recline. You have the added benefit of the row in front being unable to recline. The window seat was a little drafty due to the exit, but wasn't too bad. A great row if you're tall and traveling economy! What a horrible plane for over-the-ocean overnight flights. Small, crampy, confining, absolutely uncomfortable. Avoid flights that use small-body planes for overnight flights and over-the-ocean flights! Tons of legroom, more than any other E+ planes by United. Large high quality entertainment screens, good recline. 757-200 is my favorite for transatlantic flights. For longer than 7-8 hours flights you will need some space to walk around which is completely missing here. 7A is a great seat for legroom but your luggage has to go in an overhead behind you and trying to get baggage while people are disembarking is troublesome as most passengers just try push past you and do not allow you to get your bag. The Economy Plus legroom is great and with this aisle seat, you can even just swing your legs around into the aisle to let the window and middle passengers get by. Flew transatlantic and it was very comfortable. The pilots rest seat is 4A. For all but the shortest international flights if you are in 4B you will have the pilots climbing over you as they rotate through their rest breaks every couple of hours. This version of the 757-200 is where you will get the most seat pitch and leg room of any economy plus seat and airplane on United. This row has about 37 inches of seat pitch compared to the average which is 34 inches. This seat is for tall people because the person in front can't recline on you. However the arm rest on the window seat is fixed due to the exit row. Seat was extremely cramped - small seat, little space to seat in front. Impossible for middle and window passengers to pass. Controls didn't work, movie selection limited. Economy Plus is very good on this aircraft. On most United aircraft, Economy Plus means 4 extra inches of knee room at most seats. On this aircraft you get at least 6 extra inches. It's only two inches, but it's a big difference. Some people don't like having a single aisle on a longer flight on which they expect a twin-aisle aircraft, but you are going to spend far more time in your seat than roaming the aisles, so I'll take the legroom if I can get into Economy Plus or Business. We paid extra for these exit row seats and felt like they should have paid us to sit there. The seats don't recline, which we knew, but the way the seat is shaped you are pitched forward slightly. Everyone in row 20 complained almost immediately after we sat down. Both my husband and I had back pain for days after. The door encroaches on leg space slightly and there is a vent near the door which makes the area round your legs drafty and quite cold. Seats 8A-8C comfortable but susceptible to galley noise when crew busy preparing for service. Ticket bought from Air Canada but flight ran by United. NJ to Lisbon. Very very very uncomfortable seats. Stiff and would not recline at all. Even we could not use the neck rest. Sat upright all night. Stiff neck for 2 weeks. United charged us $500 for the 2 upgraded seats. Worst experience of life time. This is a very comfortable seat. If you have to sit in coach for 8+ hours, this isn't a bad way to do it. Very comfortable and plane looked freshly refurbed. I've been on this plane type several times between EWR and LHR. Exit row 20 has NO recline. Very upright. Lot's of leg room but tough to sleep/sit for 8+ hours. My comment is about row 1 versus rows 2, 3, 4 in First. The comment applies to all seats in the row - A, B, E, F. These lie-flat seats have a floor-level cut-out for storing a bag and/or foot room. They also have a shelf for storing low-height items such as magazines or books during flight (after take-off and before landing). The width of these areas is significantly wider and thus more comfortable in row 1 than in rows 2-4. United flies 2 versions of Boeing 757-200.